For the first twenty years of the city’s history the streets became impassable in wet weather, water stood in stagnant pools and basements flooded with every rain. At best the lack of drainage constituted an intolerable nuisance, at worst a serious menace to health. The shortest route to China. Raising buildings to the new street level became a major occupation. Visitors found the operation as fascinating as the packing houses and grain elevators, their usual subjects of interest. There is evidence in primary document sources that at least one building in Chicago, the Franklin House on Franklin Street, was raised hydraulically by the engineer John C. Lane, of the Lane and Stratton partnership. 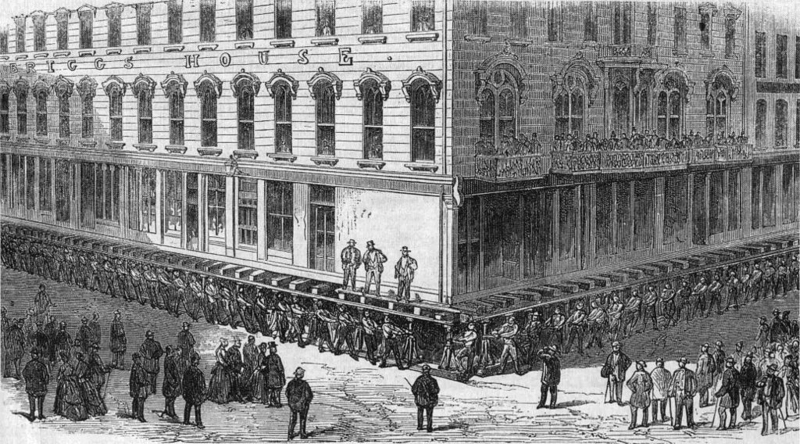 These gentlemen had apparently been using this method of lifting buildings in San Francisco since 1853. A most notable improvement is in progress on the best business portion of Lake street, where under contracts taken seperately, but being conjointly performed by several firms, the Marine Bank building, which is of Athens marble and five stories high, is being raised to grade, together with all the stores of the four story brick blocks adjoining on the east. This is the heaviest undertaking of its class ever attempted in this city. The entire front extending on the north side of Lake street, from Clark to La Salle street, is to be raised to grade at once. This row contains some of the heaviest buildings in the city, and the task will be one of no ordinary proportions. During all the time of its performance, the business of the numerous stores and offices will be but slightly interfered with. Ely & Smith have the contract for raising the east 140 feet; Pulman [sic] & Moore, the west 100 feet; and Brown & Hollingsworth, the remaining 80 feet. Workmen are already engaged in placing the blocks under the stores Nos. 136, 138 and 140, and under the Marine Bank building. The cost of raising the entire block to grade will be about $16,000, exclusive of the masonry required. Messrs. Carter & Bauer, architects, superintend the entire work. It is to be pushed with all possible dispatch, and by early in the summer a permanent and durable flagged walk will extend along the entire front. The basements under the whole will be of the first class. On the opposite side of Lake street, the old “rotten row” of wooden structures is being removed, to give place to permanent first-class business blocks worthy of that site. This block, to be erected by Messrs. Magee, Blackman, and Dr. Sawyer, is to have a front of sixty feet on Lake street, making three stores, two of which, lying nearest to La Salle street, having a depth of ninety-three feet, and the third a depth of one hundred feet. The entire block will be four stories high, with basement; the front to be of pressed brick, with stone window caps, sills and cornice. The lower story will have an ornamental iron front, with patent rolling shutters. The whole is to be fitted up in first class style. Messrs. Carter & Bauer are the architects. The contract for the mason work has been taken by Messrs. Wallbaum & Baumann, and the carpenter work by Boggs & Son, for Magee & Blackman, and by Campbell & Heiney for Mr. Sawyer. The cost of the entire block will be about $20,000. The entire front of first class buildings on the north side of Lake street, between Lasalle and Clark streets is now rising to grade at the rate of about twelve inches per day. It will be at its full height by to-morrow night, when it will constitute a spectacle not many of our citizens may see again, if ever, a business block covering nearly one acre, and weighing over twenty-five thousand tons resting on six thousand screws, upon which it has made an upward journey of four feet and ten inches. Probably its parallel enterprise cannot be found the world over. It will be worth seeing tomorrow, and the contractors are, we learn, preparing to accommodate the public and give them an opportunity of looking and passing in among the forest of iron screws. Then we propose to say something more in detail regarding this notable and wonderful enterprise, to which we have often made reference. For the past week the marvel and the wonder of our citizens and visitors has been the spectacle of a solid front of first class business blocks, comprising the entire block on the North side of Lake street, between Clark and La Salle streets, a length of three hundred and twenty feet, being raised four feet by the almost resistless lifting force of six thousand screws. The block comprises thirteen first class stores and a large, double marble structure, the Marine Bank building. Its sub-divisions are a five story marble front block of three stores; a four story block of three stores; a second four story block of three stores, and a five story block of four stores, at the corner of Clark street—these all presenting an unbroken front, in the heart of our city, and filled with occupants. It presents some of the best retail establishments in the city, and some of the heaviest stocks of Drugs, Dry Goods, &c. Its upper stories are full of offices, and contain millinery rooms, printing establishments, binderies, &c., &c., and yet, so admirably has the work been conducted, the ceaseless daily tide of pedestrians has not been impeded, but rather increased, from the novelty of the sight, and the merchants and others even speak of an improved trade, though they will welcome the completion of the work none the less. This absence from annoyance to the merchants and the public, is due to the skill with which the contractors have hung the sidewalks to the block itself, and carried up the same with the rise of the building. The block has been raised four feet eight inches, the required height, in five days, ending with Friday last, and the masons are now busy putting in the permanent supports. The entire work will occupy about four weeks. An estimate from a reliable source makes the entire weight thus raised to be about 35,000 tons. So carefully has it been done that not a pane of glass has been broken nor a crack in masonry appeared. The internal order of the block has prevailed undisturbed. The contract was taken not jointly, but so carried out, by the several firms of Brown & Hollingsworth, Pullman & Moore, and Ely & Smith, and for an aggregate price of $17,000. That sum will be nearly doubled by the entire improvements contemplated on the block. The process of raising, as indicated above, is by the screw, at six thousand of which three inches in diameter and of “three-eighths thread,” six hundred workmen have been employed, each man in charge of from eight to ten screws. A complete system of signals was kept in operation, and by these the workmen passed, each through his series, giving each screw one-quarter turn, then returning to repeat the same. Five days labor saw the immense weight rise through four feet and eight inches to where it now stands on temporary supports rapidly being replaced by permanent foundations. The work, as it stands, is worth going miles to see, and has drawn the admiration of thousands within the week past. It is of a class of improvements peculiar to our city, in the change of grade adopted, and the block in question will stand as a marvel for years to come, a monument to this gigantic enterprise of our young city. Probably only two cities on this continent will have a similar record Chicago, and—prospectively we learn—New Orleans, extensive portions of which it is said will be submitted to this process, to the improvement of the health and welfare of its citizens. We are it will be seen, educating men and firms here who will do the work of the Crescent City, but we are not ourselves quite done with them yet. A sketch of this great work, and photographs have been taken for the London Illustrated News, also for our own Illustrated weeklies. A fine lithograph is also under progress, as a faithful souvenir of the work. The contractors deserve all praise for the skill and faithfulness with which they have brought the great undertaking so near its end. RAISING AN IRON BLOCK OF BUILDINGS. The largest job of building raising ever effected has just been completed in this city by Messrs. Hollingsworth & Coughlin, in the elevation of the Robbins’ iron block, corner of Wells and South Water streets, to grade, a height of twenty-seven and a half inches. The block is very solidly constructed, of iron and heavy masonry; is five stories in height, eighty feet in width, and one hundred and fifty in depth, and with the immense stock of merchandise it contains, is calculated to weigh at least twenty-seven thousand tons. In addition to this mountain weight, the stone sidewalks, two hundred and thirty feet in length, have been raised with the building, and the whole has been done without the slightest crack or damage, and so quietly that there has never been apparent any evidence that its foundation consisted of jackscrews and not of solid stone and bricks. To effect this truly Herculean task, the contractors have employed no less than one thousand five hundred and eighty jack-screws and four hundred thousand feet of lumber, and with these appliances have done it all in the short space of twenty-one days from the time when they first got possession of the premises. This positively wonderful feat well establishes the confidence hitherto felt by the property owners and builders of Chicago in the ability of Messrs. Hollingsworth & Coughlin, to move anything moveable and its success has already brought them offers to make a trip to Paris, France, for the moving of some heavy blocks of buildings there which European mechanics frankly confess to be beyond their power. It has often been said that American mechanics only wish to know what is to be done, and they will find a means for doing it, but a stronger exemplification of this has never been offered than in the present instance, and after this the story of the man who “went back and drawed the cellar too” can scarcely be deemed improbable. It may not be out of place to say, as showing the confidence reposed in the contractors, that the architect of the work—J. M. Van Osdel, Esq.—than whom there is not a more particular man in the business, has only visited the scene three times since the commencement of the work. In Chicago a building (Robbins’) 80ft. by 160ft., five stories high, and weighing 27,000 tons, has recently been raised 2ft. from its original foundations. It was done by means of 1,580 screws placed underneath the building and turned simultaneously. The work occupied three days. The Briggs, which has ever succeeded in uniting those rare elements of hotel character, popularity and respectability, is about to materially increase its claims to public patronage. During the coming season it will be raised some four feet two inches to grade, the lower part completely remodelled, and the entire house refurnished at an expense of some fifty thousand dollars. Great blocks of masonry in some parts of the city have been lifted up from four to fourteen feet. The Brigg’s House, a gigantic hotel, was rasied four and a half feet, and new foundation built below. The people were in it all the time, coming and going, eating and sleeping the whole business of the hotel preceeding without interruption. The Tremont House, another large hotel, was lifted the same way.